A sweet favourite for 150 years. What is the secret of daifukumochi’s popularity? Wagashi, traditional Japanese sweets, enjoy both a long history and over 100 different varieties. They took their contemporary form during the long years of peace in the Edo period (1603-1868). In the latter half of that period, the common people began to create their own cultural products that resonated with their daily lives. Everyone enjoyed seasonal celebrations like cherry-blossom viewing in spring and fireworks in summer, and seasonal sweets also began to appear. A boom in travel meant that people began to taste local sweet specialities. One of the most popular traditional sweets created during the Edo period was the daifukumochi. It is written with the characters for big, happiness and mochi (glutinous rice cake). The name of the sweet comes from its effect – your belly swells with cake and you’re happy! Daifukumochi consist of a soft, white mochi exterior which is then stuffed with “an” (sweetened bean paste). Mochi are made from special mochigome rice (a different variety to regular rice) which is steamed and then pounded to create a distinctive sticky texture. To prepare an, boiled azuki beans are sweetened with sugar. The taste of an is one of the cornerstones of traditional Japanese confectionary. Azuki themselves are rich in protein, vitamins and minerals, making them an excellent source of nutrition. Mochi are also digested slowly in the gut, allowing for the efficient release of energy and a feeling of fullness. Just as their name in Japanese suggests, they are the perfect snack for when you are feeling a little peckish. Kitaya Wagashi who are responsible for the popularity of dorayaki in the UK, have recently started making daifukumochi. The family of owner Taguchi Harue manage a chain of twenty sweet stores in Japan. 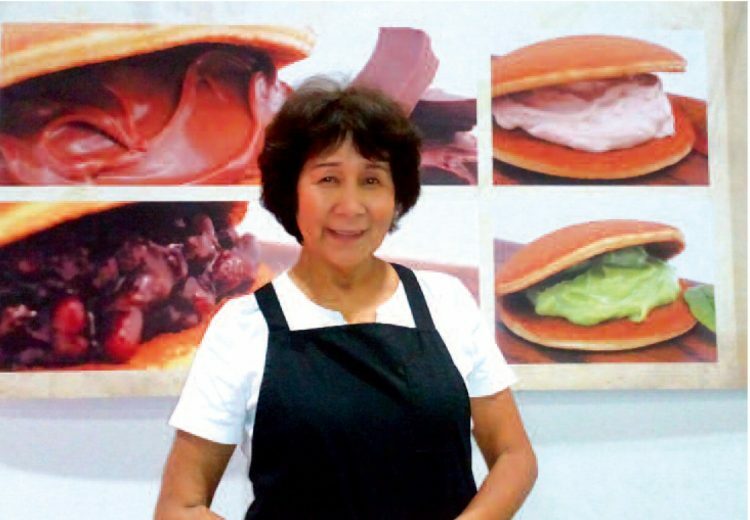 Initially Harue had no interest in learning how to make wagashi, but her British husband decided to try making dorayaki in London and they set up their company in 1986. Given the difficulty of locating the correct ingredients, it was the first time anyone had attempted this in the UK. The quest to perfect their recipes required a long process of trial and error, and since it was before the current Japan boom, financing was not easy to find either. But eventually they managed to turn dorayaki into the number one Japanese sweet in the UK. And now, after an equally long period of experimentation with different sizes, tastes, and textures, their daifukumochi will reach shops this November. Daifukumochi are designed to be held in your hand as you eat them. Kitaya Wagashi’s daifukumochi are soft but with a chewy bite to them. When you first bite into them, the mochi stretches and the sweet tang of the rice fills your mouth. This is followed by the perfectly judged sweetness of the bean paste. It’s perfectly balanced and utterly delicious. They have also adjusted the size. Japanese daifukumochi are a bit bigger, but Harue decided to make theirs smaller and easier to eat. And to make it easier to share, they come in packs of two. The daifukumochi will have the regular an filling, but in Japan daifukumochi can have all kinds of fillings: coffee, fruits like strawberries, even chocolate! Kitaya Wagashi are currently experimenting with new fillings so their line-up may expand in the future. Daifukumochi are available at Japanese stores and supermarkets.